This Paper examines some of the benefits and dangers of Taiwan's deepening economic ties to China. In brief, the expansion of cross-Strait economic relations has benefited Taiwan economically, but may pose serious dangers to Taiwan's democratic sovereignty. China's rising Comprehensive National Power - which aims to suppress Taiwan's sovereignty and self-government - has been significantly enhanced by investment from Taiwan itself. 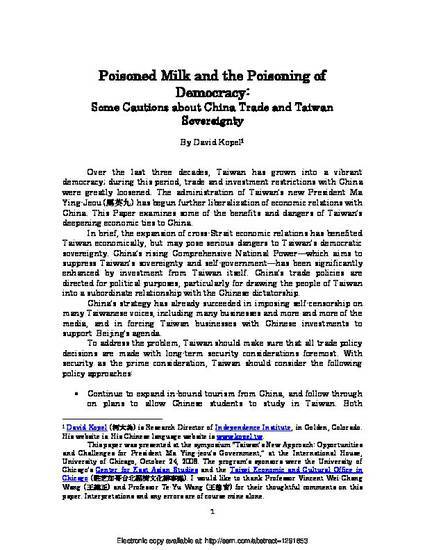 China's trade policies are directed for political purposes, particularly for drawing the people of Taiwan into a subordinate relationship with the Chinese dictatorship. China's strategy has already succeeded in imposing self-censorship on many Taiwanese voices, including many businesses and more and more of the media, and in forcing Taiwan businesses with Chinese investments to support Beijing's agenda.